How to change the price of the items based on a time value? Is there a way to all for your product at a special price for a set amount of time?For 24 hours, I would like one of my products to be $15 cheaper. Is there a way to set this up automatically, or do I have to do it manually? Meaning after 24 hours, I have to change the price. There is no direct way to do that, but there is a workaround. What you could do is to place one time field that will always use the current time. Then by using the conditional logic, you will say that if the time is 24h from now, or whatever time you like, hide the payment field plus you can show some message. I say hide the payment field, even though you just want to change the price, but what I meant is hide the items you're selling and show other items (with changed price). 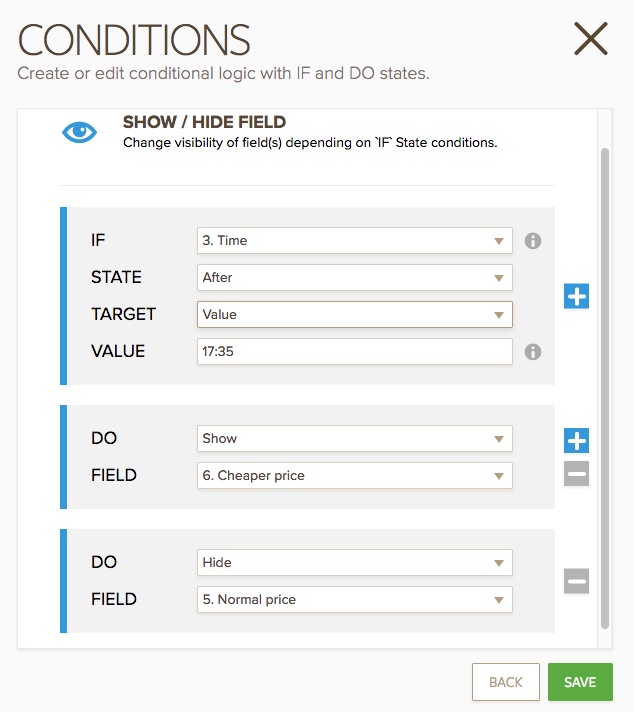 I used form calculation field to calculate the total price of the items (that field can be hidden) and value from there is passed to PayPal payment field. Also, you should make the time field hidden. So every time your user loads the form it will hold the current time, if the current time is after a specified time, hide the payment. Please let us know if this could work for you.